The turn of the year is nearly upon us and it’s time to start planning your 2019 adventures. Experience the true culture of your destination by hiking through authentic towns, villages and countryside. We have chosen some of our favourite tours for 2019. If this is your first time on the Camino and you are looking for ‘the Camino’ experience, the Camino Frances is the way to go. This is the route that features in many famous movies such as The Way and I’ll Push You. The good news is that you don’t have to walk for a full month if you don’t want to, you can start at any stage along the way. It is worth keeping in mind though that you will have to cover at least the last 100kms (63 miles) in order to get your Compostela pilgrims certificate in the Pilgrims Office in Santiago. The beauty of the Atlantic is the pilgrim’s travel companion along the Portuguese Coastal Camino from Porto. This route is relatively flat and a little kinder on the legs for beginners. This also makes it the perfect route for cycling. 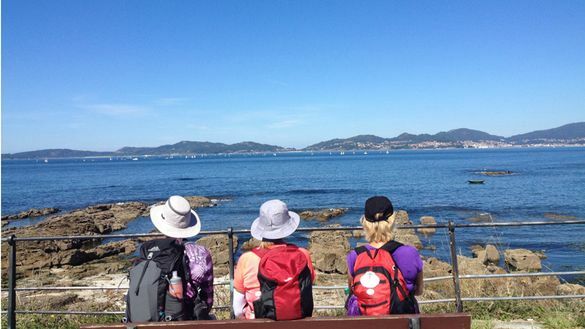 The full Portuguese Coastal Camino takes two weeks to complete. The journey begins in the gorgeous and colourful city of Porto. Experience a mix of Portuguese and Spanish culture as you cross the border on your way to Santiago de Compostela. Delicious seafood, sandy beaches and lush landscapes await. Once you discover the magic of the Camino it is easy to get ‘addicted’ to the trails. In fact, many pilgrims return each year to walk or cycle different routes. There are many trails available to the seasoned Camino fan. For those looking to discover the Camino trails in France, the Le Puy Camino is one of the most traditional ‘Chemins de St Jacques’. Picturesque historic towns such as Conques, Le Puy en Velay or Cahors, as well as peaceful rural tracks, make it a Camino to remember. Is it peace and tranquillity you are looking for on your Camino? It’s time to switch off your phone and visit the Camino de Invierno! This is a path less travelled and offers time for quiet reflection in nature. This is a beautiful route, with plenty to see. Romanesque churches are dotted throughout the region You are surrounded by gorgeous wine courtesy of the vineyards in the Ribeira Sacra Valley. Those looking to meet people and travel with a group should join one of our guided tours. Share your Camino experience with new friends. You will be looked after from the moment you arrive, one of our expert guides will be with you every step of the way. Our Camino Walk and Coach tour are ideal for Camino beginners, a perfect introduction to the uniqueness of the Way of St James. Each day includes an easy 1 and a half to 2-hour walk in some of the most scenic regions on the Camino. The Rota Vicentina (Fishermen’s Trail) is a magnificent coastal trail taking walkers along the shores of the Atlantic Ocean in a region of spectacular beauty in Southern Portugal. Ireland is the perfect location for hiking. Unspoiled green countryside, cosy local towns and the famous Irish welcome are some of the treats on offer. Starting in Canterbury, the Via Francigena is a spectacular and epic pilgrim trail dating back to the Middle Ages. Walking in Tuscany is one of the undoubted highlights. For more information and images, contact Maria at maria@caminoways.com or Karl at karl@caminoways.com.